Airmail printed envelopes are used to keep & send simple as well secret documents inside and outside the country. Sticking to its meaning, we provide best airmail envelopes which are printed according to client's needs. 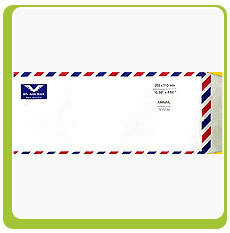 We offer variety of airmail printed envelope which are impressed with demanded words. We are well known airmail envelope manufacturers. About the Company Lucky forms is a prominent entity in Security Printing and renowned manufacturers of Continuous & Roll Type Computer Stationeries. Conceived in 1992, lucky forms has scaled due to a high level of industry comprehension and par excellent products and services. From humility to prosperity, we have risen above comparison on account of our strong customer base and a broad spectrum of products, with new additions each day. Our computer stationery products are supplied to a number of reputed Government and Corporate sectors in India. Printing in any foreign language is not an issue; we give you a whole range of options to pick from. It is over a decade of reliable services, our quality pre-printed computer stationery products and customized support policy that has earned Lucky Forms its well deserved respect.